Find new ways for Lucky to burn off excess energy. Spinning, like tail chasing, is typically a compulsive learned behavior. The cause is often boredom, but it may also be a response to excitement. Obsessive behaviors are exhausting and distressing for dogs. Your job is to figure out the cause. Once you know this, you can implement the correct solution. Take Lucky to the vet for a thorough checkup. Before you begin to treat troubling behavior, you want to be sure it's not being caused by a medical problem. 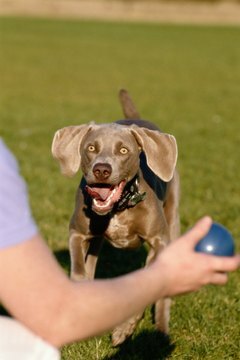 Your vet can tell you about psychiatric medication that may be able to help control your dog's urge to spin. Observe Lucky’s routine and make notes of the stimuli that lead up to a spinning episode. This will help you identify the cause. For example, he may do it when excited by the sight of his leash, or when the doorbell sounds. If he does it only when the house is calm, the cause is probably boredom. Adjust Lucky’s daily routine. Take him for lots of long walks to tire him out and provide him with plenty of stimulating activities, such as food puzzles. This will help stave off boredom. Expose Lucky to the troublesome stimulus, if there is one. Repeatedly introducing it into the daily routine will reduce the amount of excitement he feels about it. For example, a dog who spins at the sound of the doorbell is doing so because he’s excited about greeting a new guest. So ringing the doorbell every hour dulls that excitement, as the dog slowly figures out that the doorbell is a mundane part of his daily experience. Modify your own behavior. You may have inadvertently encouraged Lucky’s spinning behavior by reinforcing it when he first started doing it. If you reacted by calling his name, laughing or physically touching him to make him stop, he may have figured out that spinning gets him attention. It’s essential to give Lucky as little attention as possible during a spinning episode. Conceal a food treat in your hand. Walk toward Lucky and hold the treat to his nose. Let him get the scent. Move the treat slowly up and behind his head. Say, “Sit” in a calm friendly voice as you move the treat. Lucky will follow the treat with his nose. Eventually he’ll sit down so he can follow the treat all the way back. Release the treat and give lots of praise. Timing is key is here. Make sure you release the treat as soon as his bottom hits the floor. With sufficient repetition, Lucky will learn that sitting when he hears the command has a positive result. Eventually you’ll be able to lose the treat totally and just use your voice to command him. Dog behaviorist Dr. Jeff Nichol recommends using planned, structured interactions to divert your dog’s attention from his obsessive spinning. The "Sit" command is particularly effective as a distraction, as it places his bottom on the floor, preventing him from spinning. Expose Lucky to his triggering stimulus. If he begins to spin, issue the "Sit" command, then reward him with a treat. Over time, he’ll learn that sitting instead of spinning has a positive outcome. Can You Keep a Dog With Parakeets? Can the Wrong Dog Food Cause Excessive Shedding?